Now more than ever before, candidates seeking positions in the hospitality industry must display professionalism and a steadfast commitment to quality in every phase of the application process. Experts suggest that your resume - often the very first chance you have to make an impression on a prospective employer - may be the single most important part of this process. A resume serves many purposes: it's your calling card, your personal marketing toolkit, and an abbreviated summary of your entire employment history. If your resume is well-designed and persuasive, it can serve as your ticket to a better career. However, on the other hand, if your resume is awkward, error-riddled, or just plain ugly, even the most exceptional employment history may not be able to persuade the hiring manager to give you further consideration. When a single piece of paper is representing you to potential employers, every detail should be just right. It is often assumed that the hiring decisions are made objectively, and that the candidates who are most qualified for the open position will inevitably rise to the top and be selected. In reality, though, this is not always the case. Hiring managers are only human, and the human mind tends to process information in a more subjective manner. Even seemingly small details can have a big impact, so it's well worth it to take the extra time to craft an exceptional resume. The bad news? Even the most experienced candidates will likely be passed over if their resumes and application materials make an unfavorable impression on the hiring manager. The good news? Keeping a few simple guidelines in mind, you can easily retool your resume to make it more persuasive and effective. With some thoughtful, carefully targeted revisions, even the resume of a less-qualified candidate can catch the interest of a hiring manager. Every position you apply for represents a different opportunity, and each position is deserving of a uniquely tailored resume. To save time, you can use the same basic template for every resume. It is very important, however, that you customize the details of your resume to address the unique requirements of each job you are applying for. Hiring managers are much more likely to be responsive to application materials that speak directly to their organization's needs. An obviously generic resume, on the other hand, may be taken as a sign that you weren't sufficiently interested in the position to invest any extra time in the application process. Even a few personalized details can vastly increase your chances of success. You can use the following guidelines to customize your resume for each company you are contacting. Align your objectives with the company's. The functional resume format that begins with a statement of your objective as the first heading is more popular than ever. But surprisingly few candidates take the time to modify their objective statement for each position applied for. This will convey the impression that you know what you want and you'll be on the right path toward your career goals with this position. Find out what the company needs -- and be it. Scrutinize the position description or the company's mission statement, and then tool every statement in your resume to address these needs. Don't stretch the truth, but make sure you frame your experience in a way that is as consistent as possible with the company's stated needs, values, and goals. Every word in your resume, cover letter, and other application materials should resonate with your potential employer's requirements. Put the spotlight on results. Sure, it's important to outline your past employment experience and responsibilities in your resume. But it's even more important to highlight tangible results you've achieved. Experts suggest that you include a separate 'results' heading with bullet points that list achievements such as stellar rates of appetizer, dessert, and drink upsells or dramatic customer satisfaction improvements. Ruthlessly eliminate spelling, grammar, and word-use errors. Nothing will guarantee your failure faster than a resume that is riddled with glaring mistakes. Make use of every resource available to identify and get rid of errors, including word processing programs, university writing centers, tutors, or even professional resume consultants. The time and money that you expend to fix these problems will be repaid many times over. Don't send your resume out there alone. While experts agree that your resume is probably the single most important part of your application package, a well-written cover letter can also be enormously helpful. A succinct opening paragraph should demonstrate awareness of the company's business and current needs. In closing, draw attention to a few of your most impressive qualifications, express gratitude for their consideration, and request a meeting to discuss the opportunity further. 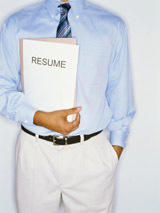 • 3 Common Resume Problems - Does Your Resume Fall Prey To One Of These?